The head of Iran’s Atomic Energy Organization, Ali Akbar Salehi, has said that Tehran cheated on the 2015 nuclear agreement with the 5+1 Powers (US, UK, France, Germany, China, and Russia). Salehi was trying to rebuff criticism from Iran’s hardliners who have said the Rouhani Government is too weak in its approach to the West. But in doing so, he offered material for those outside the Islamic Republic who want to scrap the accord, possibly jeopardizing Iran’s effort at links with Europe to counter US sanctions. The focus of Salehi’s comments was the Arak heavy reactor, under construction at the time of the agreement. Western countries were concerned that the plant’s plutonium by-product can be used for nuclear weapons. So Iran agreed in the 2015 accord to halt Arak’s development until it was redesigned. Iran was supposed to pour cement into the reactor core. 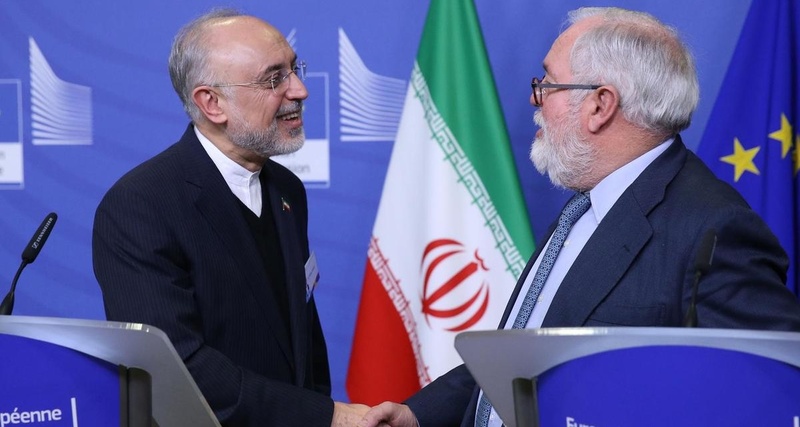 But Salehi said on Thursday, in an interview on State TV, that the material was only put into a series of tubes for which Iran already has a replacement. He declared that a picture showing the core of the reactor filled with cement was “photoshopped” by Government critics. Then, in another supposed revelation, Salehi said only he and the Supreme Leader knew that there was an alternative “calandria” for the cement. He said the deception was necessary because Ayatollah Khamenei had warned the West would renege on the deal. He pushed against the hardliners, “Had we done that [poured cement into the core], there would be no reactor now.” he said. Salehi said earlier this month that Iran can return to production of 20% enriched uranium — which potentially can be further enriched to a military grade of more than 90% — “within days”. Under the 2015 agreement, Iran shipped out all its 20% uranium and ceased further production, with tight restrictions on research and development. The statements cast a further shadow on Iran’s talks with the European Union for a Special Purpose Vehicle for non-dollar trade in oil and other goods and commodities, circumventing the comprehensive US sanctions imposed on November 5. The implementation had stalled over a European host for the arrangement, and Iranian officials appeared to give up earlier this month. But in recent days, European leaders such as French Foreign Minister Jean-Yves Le Drian have said the activation of the SPV is imminent. The story doesn’t sound plain. Surely the reactor, which was far from completion, would have have been inspected by the IAEA. It was a declared nuclear facility meaning the IAEA had every right to visit it.